said Board general secretary Maulana Syed Mohd Ashraf Kachochavi, addressing a large-sized Maha Panchayat of Sunni Muslims here. The Maulana also asked the government to immediately pass legislation to set up a Central Madrasa Board so that fundings to madrasas could be audited and a watch kept on the flow of Saudi petro-dollars into madrasa education. The Maha Panchayat was a sort of “coming out” event for the AIUMB, which claims to represent 80 per cent of Sunni Muslims (themselves accounting for the largest share of Indian Muslims) and yet has been barely visible on the Indian Muslim political and cultural scene. Board members stressed the threat from Wahabi extremism over and over in their speeches to the Maha Panchayat, arguing that a small group of people had succeeded in giving a bad name to Islam and Muslims, most of whom were Sunni Sufis and therefore peace-loving, tolerant and intensely patriotic. Speakers also emphasised the essentially inclusive nature of Sufism which did not differentiate between Muslims and non-Muslims and allowed all communities to pray in their shrines. The Deobandis, on the other hand, did not allow their followers to go to Sufi dargahs. Remarkably, the Maha Panchayat appeared to have been boycotted by the influential Urdu press. Last week, when the Board held a press conference in Delhi, Urdu journalists were openly hostile to the organisers, arguing that the AIUMB was trying to divide Muslims, and was no different from the Sangh Parivar, which saw all Muslims as terrorists. 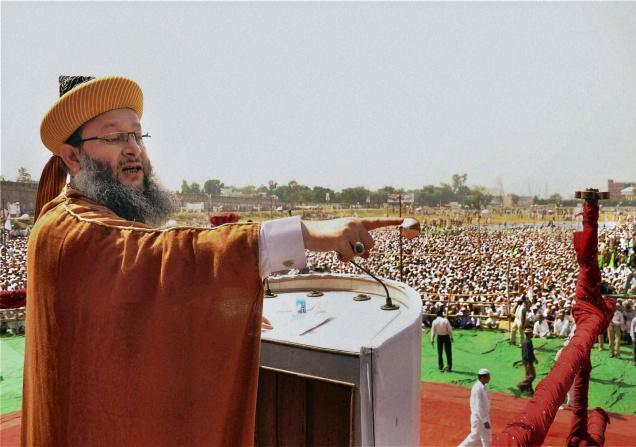 Picture: Voice Against Terror: All India Ulama and Mashaikh Board president Hazrat Syed Muhammad Ashraf Ashrafi addressing the Muslim Maha Panchayat of board in Moradabad on Sunday. Photo: PTI. The need of the hour is to impart lessons on Aqeedah to the general Sunni Muslims population on a war-footing. And I just don't understand why this is not being done. It is the lack of the knowledge of Aqeedah which is mainly responsible for the influence of wahhabism on Indian soil. The lessons in Aqeedah should include the subjects of Ruh (soul/spirit); the pleasure and pains of the world of grave; the meaning and significance of the HOly Prophet being alive in grave; the compulsory love of the Holy Prophet (s); the right meaning of Tawassul, Istigatha, Shifa, the knowledge of Unseen, etc., and how Islam respects Humanity. Formerly, this was not needed because there was no threat and so emphasis was on Fiqah (jurisprudence). Not so now. Hence the said switch is needed.